Imagine my surprise when I realised I hadn’t written a blog post since the end of last year! Lawks! I’ve been writing drafts when I can but poor ole Betsy the laptop has usually (always) got too many browser tabs open to cope that well! How is it possible that time passes by so quickly these days?! I have been posting on the Facebook page though of course. Just never seemed to get to complete a blog post. The main reason has been lack of Brain. It pops in now and again but it doesn’t hang around as long as it used to. So I realise I need to change my way of writing to accommodate this change because mostly it’s resulted in me not writing. And as writing has become a love of mine I have been getting twitchy! As I’m in the UK I was initially dealing with the tail-end of the continuing coldness through the Winter. Always a toughie getting through to the Spring, eh? Pain levels are up, natural vitamin D intake is down, relentlessness is the name of the game and by the end of Winter (well deserving of it’s capital W) we are begging and pleading the weather to bring Spring to us so that we can start recovering. Winter was actually pretty mild here, but that just means that I wasn’t at quite such an extreme of my wits end, y’know? Winter is *always* hard. Springtime rocks! I’ve been having some more health issues and I’ll write more about that in due course, but initially it appeared like it was a crazy-arsed allergic reaction to anything / nothing / everything which lasted all the time / 4 random minutes at a time / stopped for a few hours then came back with a vengeance. It was pretty weird. And yes it became apparent that it was so bizarre that it was reminiscent of my respiration issues a few years ago, so I knew it was a systemic overload which had to be stopped. Hence.. more on that in a separate post. In March I said “yes” to a concert because I figured how could I not? I mean, it was in Winchester Cathedral, maaan! Beautiful! I didn’t realise just how cold it would get in there or that I should’ve dressed for the outdoors to better manage my pain levels, but fortunately they had some doghouse sized radiators to cuddle up to! So yeah, I went and saw Anathema perform acoustically in a gorgeous cathedral. It was stunning. Truly fabulous. There are a few cathedrals around the UK who raise some of their funds through events like this so if you get the chance… dress warm, take a cushion if you need one, and because it’s acoustic it’s not like you’re gonna get your head blown off by mega-speakers so the volume is more compatible with sensitive ears (though if you’re unsure I can recommend the noise-reduction earplugs as they reduce the volume without muffling the sound). Two of my friends got married and Magic Dude and I attended the sci-fi wedding in Star Wars fancy dress. Which I made with my own fair hands, I might add! My sewing machine and I are no longer nemeses, we have made friends and now I wish I had more time during which I am more functional to make some clothes. I now have a new creative project with the sewing machine which I’ll post about soon, too. And for anyone wondering… I am dressed as Jareal (after the make-up has come off and been re-applied a gazillion times X-) ) who I found out about by researching the comic characters, and Magic Dude is dressed as Plo Koon who was briefly in one of the prequels (very briefly – when asked about his choice of wedding costume he said something like “you see him in one of the spaceships for a moment and then he dies”). And of course that same month we had the UK government election. Voters were at a loss who to opt for if they even voted at all, many didn’t. The ‘majority’ on our ‘first past the post’ system was a shock. The majority means the party who got the most votes, even though the people who voted for them are actually in the minority of the voting population. Even weirder, our system is set up for the main parties and to keep smaller parties at bay. So this means that votes for the Conservatives adds up to more MPs from their party than exactly the same number of votes would get for another party. I know. Don’t ask. It’s so out of date. Anyway the shock factor was massive. No-one expected the same government to be voted in again. Not even the government peeps themselves! Many of my disabled friends were in tears at the news – welfare cuts have been horrific here with the poorest and most vulnerable getting hit multiple times through different cuts. The new welfare ‘assessment’ process is causing mental health issues to the extent that there have been suicides as a result. Before getting re-elected the government promised a further £12billion welfare cuts so you can see why so many people were in tears. I seemed to last a while in shock until Magic Dude’s Dad said something blinkered and I burst into sobbing and couldn’t stop for some time. The UN is now running a second investigation into the state of human rights in the UK to expand on their earlier investigative report. So yeah, now I’m an activist. As it turns out. Not just a health activist any more, but an activist for the poor and vulnerable generally. I can’t do much in my state of ill-health but there are petitions I can sign, ideas I can bounce, people I can help. Being chronically ill isn’t going to stop me from caring about others and doing what I can to help reduce the additional shitstorms coming their way. Takes up quite a bit of Brain Time of course, another reason I have been so absent from the blogging as usually May is the time of year when I would begin to manage to write a bit more. So anyway that’s enough for the body to have to handle whilst still working through the months slowly recovering from Winter, right? The April tournament this year was not the usual nationals in Oxford but my first ever Europeans. (The Europeans were originally going to be held in Latvia and so this was a last minute alternative and much more viable for me to get to). I performed the Sun Style 73 form which is not a flowery style so I have to show my understanding and skill levels in different subtle ways, so that was my challenge. I also performed the 42 form (a tournament form incorporating 5 different styles of Tai Chi) so performing two different things at one tournament was also my challenge. I was a bit awed that my teacher had put me in the advanced/open section whilst I am still officially at intermediate level, I guess that was also my challenge. Hey wait a minute? How many challenges am I fool enough to take on at once here?! The next day I met up with my lovely teammate who also has chronic pain and was staying in the same hotel. We have travelled our Tai Chi paths alongside each other these past four-ish years and we have cheered on each other’s progression with such joy because it’s one heck of an achievement in the face of our respective health issues. I hobbled from bed to lift, and from lift to comfy chair in the hotel lobby. I sat in one chair with my feet up on a second, had my hot water bottle under my legs, blanket over the top, painkillers in my bag and he had been his usual sweetheart self and got the coffees before I got there. Several hours later we were still there nattering away. Movement was not very viable for either of us and it was great to be company for each other through the pain levels. Pictures obviously included bicycles (and many many grotesques and gargoyles on the old buildings)…. …and a pianist on wheels who was super-prepared for any sudden change in the weather! Totally normal, nuthin to see here! (Actually his piano playing was gorgeous). The weeks between the Europeans and the June Nationals whizzed by and I was not in great shape healthwise (starting the tournament day with the screaming ouchies in my left leg at a mean 8.5/10, boo!) but I managed to get the pain levels down a bit to perform in Sun Style at my intermediate level and got a good score considering I was racing through the 5-6 minute form to complete it within the required 4 minutes *and* I added in an extra move by accident, too! X-) Being able to get a decent score with Sun style was my aim. And extra wonderful was that my teammate (yes, that same friend) got the exact same score for his multiple-style 42 form and so we ended up on the podium together with joint silver, wow! I can’t tell you how awesome it felt to be standing there with my friend sharing that achievement after coming such a long way together in our journey to help our health situations. There really are no words to describe the singing glee in the soul but it was flipping wonderful! He’s put in phenomenal work to get where he is today using both physical and psychological tools to find the best pathway round the health stuff. If anyone deserved to be standing on that podium it was him, and I found myself standing on the same podium with him which felt so perfect that I wasn’t on a different podium or even a different level – we were on there together. Go Team! I also entered the advanced/open section with the 42 form, managed to fluff it up in amazing style, made it look like it was meant to be that short honest guv’, and ended my performance somewhat (a lot) earlier than I should have, har! A good score considering the extent of my very silly error, and some wonderfully positive words from head judge Faye Yip telling me to come back next year because I have “potential”, yay! Oh and no wonder my body has been so screwed because the classes that I use for physio’ include adaptive Kung Fu in which I have got my red sash and first level brown sash this year too. I’m not entirely sure how I managed to achieve those! Although the brown grading was during the heatwave and my legs were glad of it even if my nervous system wasn’t! My body needs more tiiiiiime, man! And then we were getting the house ready to put up for sale. It sold at the end of July and we’ve been searching for our new home ever since. Not sure how much longer our buyers will hang in there but if they pull out it’ll sell straight away again. The market here at the moment for the main price bracket of £120-210k (your basic 2-3 bed homes with the usual squished space that we have in UK houses) is basically at about 15 buyers per house. Apparently we wouldn’t have the same extent of trouble if we had £210-250k. Oh if only eh?! Har, dream on! We need some more space y’see. I moved into his one bedroom place and so nearly everything I own has been in the loft for the last 5 years. If one of us wants to do something creative there’s no space to set it up and leave it so most of my physio’ time is taken up with getting everything out and setting it up and then putting it all away again afterwards which doesn’t leave much time for whatever the activity in the middle was supposed to be (I want to get painting again). So yes we need a little more space but also….an enclosed garden. Currently we only have an open outdoor space between the house and the pavement out the front. Apart from how nice it would be to have some private space the main reason is (dahn-da-da-daaaaah…) we wanna get a dog! But the housing market is slowing down for chrimble so I’m expecting our buyers to pull out sometime soonish and that we’ll be re-selling in January when potential new homes start to show up in greater numbers. Anyway, now you know I’m still here. Phew! That was a heck of a catch-up! Oh my, oh my, oh my, oh myyyyyyy! I’d been contacted by WEGO Health to let me know that I’ve been nominated for the Rookie of the Year Award a wee while ago, but today I opened up my emails to find several messages from WEGO about nominations for three other awards as well and I am currently still on a floaty cloud of happy surprise! 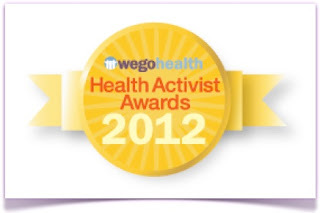 I have now been informed that not only have you nominated me for 2012 Rookie of the Year, but also for 2012 Health Activist Hero, 2012 Unsung Hero and 2012 Hilarious Health Activist! Wow! I’m totally blown away! Thank-you so much, I am challenged to find the words to adequately express my feelings as I’m still in a state of happy surprise! (With my ANS it’ll take a while for the wibbles to settle down, too, so I may as well go with it and grin like an idiot for a few hours, eh? )!